How would you recommend installing an embankment slide? Slide Installation: Follow the manufacturer’s recommendations for proper installation of the slide. NLI defers to the manufacturer’s recommendations on installation. Slide Use Zone: Per the Consumer Product Safety Commission’s (CPSC) Public Playground Safety Handbook there is a 3′ use zone required for toddlers and a 6′ use zone required for preschoolers. This is a measurement from all points at the end of the slide and should contain a safety surface that complies with CPSC Public Playground Safety Handbook (See page 36). 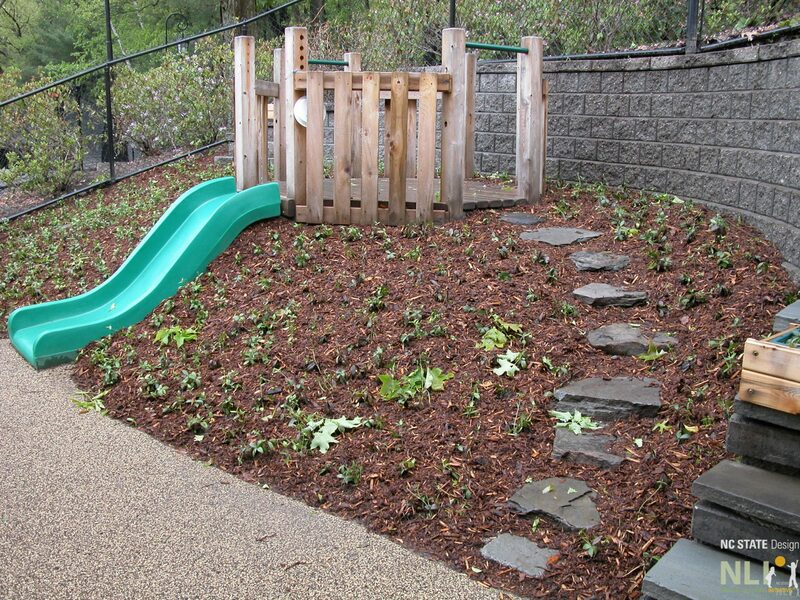 Slide and Embankment Steepness: Per the Consumer Product Safety Commission’s (CPSC) Public Playground Safety Handbook toddler slide chutes should have an average slope no more than 24 degrees. No section of a toddler slide should be steeper than 30 degrees. Preschool and school age slide chutes should have an average slope no more than 30 degrees. No section of a preschool or school age slide should have a slope greater than 50 degrees. For embankment slides, these requirements would dictate the steepness of the embankment as well (See page 35 of the CPSC Public Playground Safety Handbook). Earth Embankment and Plantings: The earth embankment surface needs to be stabilized with plant material that provides a root mat. Mulch alone will quickly be worn thin and be displaced by traffic. Stepping stones can be added along the side of the mound to create a “traffic” pattern that will assist in keeping the mulch and plant material from being worn out. Plantings Suggestions: Low shrubs and/or ornamental evergreen grasses that do not have sharp or serrated leaves and that spread vigorously would be suitable plant material. 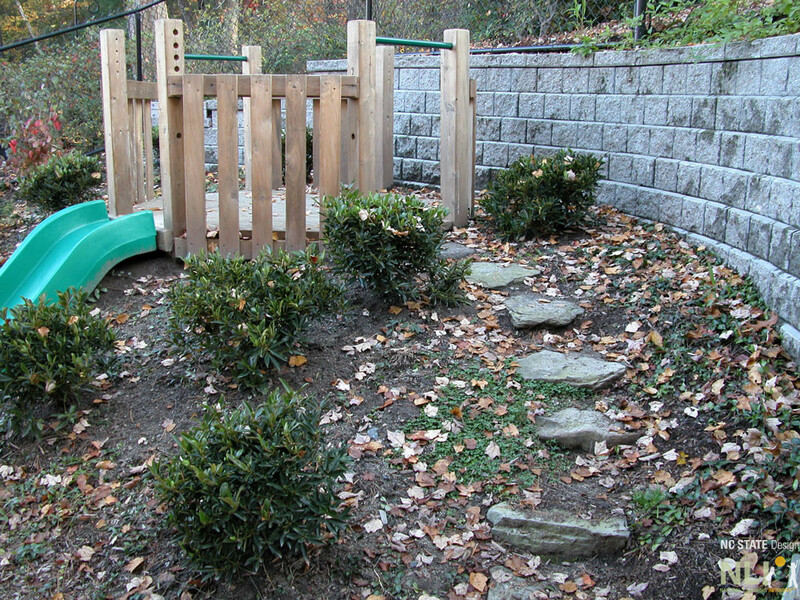 Evergreen plants would be the best option for year-round erosion prevention. Shrub choices could include tough species such as Groundcovers could include Liriope muscari ‘Big Blue’, a clumping liriope. It is inexpensive, evergreen, and would withstand poor soil conditions and foot traffic. An alternative is Muhlenbergia capillaris (pink muhly grass), which has a soft texture and is a vigorous grower. If sod is used: Bermuda grass (as long as it is cannot spread to other areas) or Zoysia grass. Avoiding erosion: Embankment slides are often installed without adequate access “up” the embankment. Typically, this results in eroded soil on both sides of the slide. To avoid this, install steps away from the slide bed that make it easy to get up the embankment for the slide “down” and plant the embankment as suggested above. 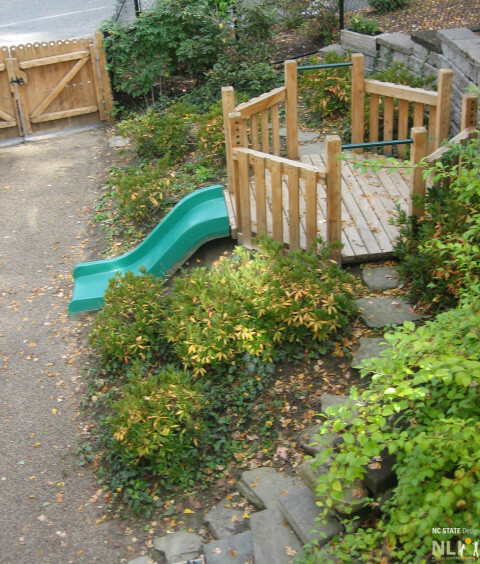 May 2004: Embankment slide with timber platform, groundcover planting and stone steps at Wellesley College Child Study Center. Oct. 2005: Evergreen shrubs had been planted on the embankment and the groundcover was filling in at Wellesley College CSC.